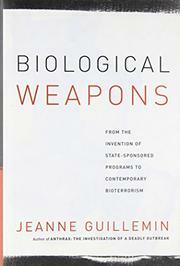 Chilling history of biological and chemical weaponry from WWI to the present. Rather than preaching a passionate sermon against evil, Guillemin (Sociology/Boston College; Security Studies Program/MIT; Anthrax, 1999) coolly marshals her facts to provide a chronology of names, dates, experiments, mistakes and sometimes deliberate use of biowarfare by major powers. She also covers the concomitant international moves toward control: the Geneva Protocol, the Chemical Weapons Convention, the Biological Weapons Convention, and sundry national laws and international agreements aimed at destroying stockpiles and empowering international inspections. New to some readers will be details about Japan’s use of plague to decimate civilian populations in Manchuria during the 1930s, Russian outbreaks of smallpox and inhalational anthrax in towns near bioweapons factories, and major British and French biowarfare programs based on fears that Hitler would launch such assaults. (Surprisingly, those fears were unfounded.) Most disturbing of all is the story of America’s ventures into bioweaponry. The post-WWII buildup of anthrax, smallpox, tularemia, hemorrhagic fevers, cholera, botulinum toxin, and other biological agents went on until Nixon’s 1969 renunciation of bioweapons, which opened an era of dismantling programs. But after the end of the Cold War and the emergence of the US as sole superpower, America started withdrawing from multilateral agreements. Growing concerns about bioterrorism led to public-health preparedness programs and biodefense research. The buildup grew after 9/ll—and so did secrecy, communication controls and failures, a lack of accountability, a growing distrust of the government by the public and of the US by the world: exactly the ingredients that can fuel bioterrorism. Guillemin advocates transparency, improving international relations to increase mutual trust, and freely shared information. The author doesn’t quite tell us to abandon all hope, but it’s certainly not reassuring to read how easily governments move from defensive programs against bioweapons to offensive use and abuse.